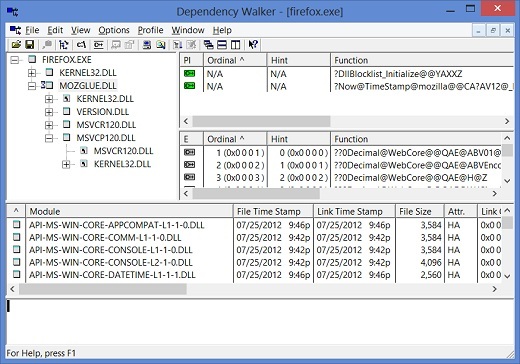 How to use Dependency Walker to inspect a program on Windows 8? I want to know what DLL libraries are used by Firefox. You can inspect a program with Dependency Walker that allows you see what DLL libraries are used by each process. 1. Double click on C:\fyicenter\ProcessExplorer\depends.exe to start Dependency Walker. 3. Review the dependent modules tree. For example, click "MOZGLUE.DLL", details of MOZGLUE.DLL are displayed. The top section displays all DLLs as a dependency tree representing the relation of one DLL invokes other DLLs. The second section displays all DLLs in a simple list sequentially.